Is this just firestorm or is this just me? I can't seem to get this to finish I can search my renters and get them on the list, but Can't seem to get it to get a selection at the bottom to put them in my group. It just hangs up like this. Is this as designed is there a way around it? I can't even do this when people are standing next to me and it gets tedious to rez something for them to click to join. 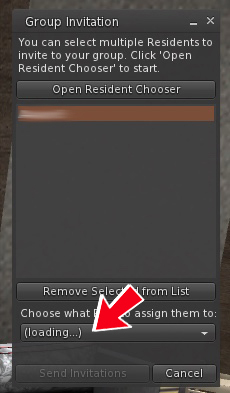 How can I fix how this works or is there a better solution for adding people to a group? Firestorm sometimes has issues with group management. I suggest using Singularity when you wish to send group invites. You can switch back to Firestorm after you send them out. its someth i found a solution for, i have,this like u as well. ones (once?) your group is 'reloaded-refreshed', u can invite the person really. its odd but i figured that out,i made a utube video from it but i didnt keep it. if it isnt clear,ill redo the video to help pple. Illan Thanks for the heads up! I will look into that viewer I use a mac so sometimes i'm not sure about how well some viewers run compared to firestorm! THANKS! I've found a work around on firestorm on my mac. 3) Make sure the group you are inviting to is active, then click the "invite" button on the lower right of the groups dialog box. It should work from there, it has for me ever time. sometimes firestrom is a bit slow and you have to wait a little. 1) Right click on their name tag floating above their head. 2) Pick "More" on the floater, then pick "Invite"
This has worked for me as well.